"Happier" is a song by American music producer Marshmello and British band Bastille. It is an upbeat pop song that draws elements from pop rock. Lyrically, the song tells "the sordid tale of a love that's over before one party wants to accept it". 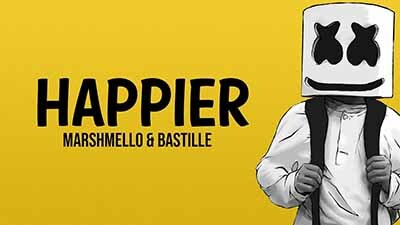 "Happier" was written and produced by Marshmello, with lyrics from Dan Smith and Steve Mac. The song reached number two in the UK Singles Chart and number four on the Billboard Hot 100 and is the highest charting single for Marshmello in both the UK and the US.